Q: How does it works? 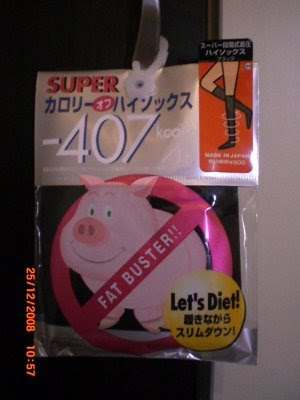 A:This is the hot popular slimming products recomended by Japan Mag, Vivi and Taiwan tv show 女人我最大. It actually made from Plant Fiber for tighten effect, which will correct the way you walk, require to burn more calorie then normal walking. In the same time, it massages to burn calorie as well. New design to fit body. With denier to tighten thigh, buttock, and waist. 407kcal ideal calories burned by wearing it and walking for 60 mins. Burn up to 399kcal per hour by walking. Made in Japan with natural plantation fiber to tighten. Be trendy and fashionable to mix match your outfit with cross check pattern. 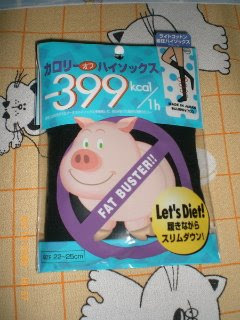 All the above are direct from JAPAN..
Q: How does Calorie Off Fat Buster Stocking works? A: This is a stocking/sock made from plant fiber for tighten effect with pressure, which requires to burn more calories. Its different pressured wave weaving design is made to control varicose veins and massaging to your body. It may contains Germanium, titanium, silver, capsicum extracts to control water retention, and avoid varicose veins. Q: Does it really works in slimming? A: It is very obvious result for person who lack of mucles at leg because the tightness of this stocking will lift it up. It helps to improve the lines of your leg. Wear it during sport/workout for more calories burn. Q: What is the material? A: Long hours standing, walking, sitting. Pear-shape body. Q: When do I wash it? A: It is recomended hand-wash with mild detergent will do, as less as possible. Maybe fornightly if you wear it everyday. Q: What is the thickness when it is thick? See through? A: For the 60denier onwards, it is not see-through. Q: Why there is 60, 70, 80 denier? What is it? How it works? A: Denier is the textile density, the higher denier the thickness and more tight. 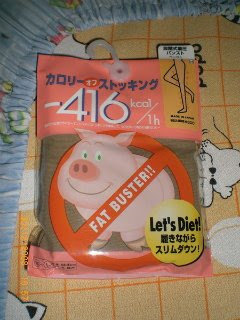 But it doesn't mean more denier is better in function, the burning calorie function depend on the design of the stocking. Q: For the arm wrap and thigh wrap, do they come in pairs? A: Yes, they come in pairs. Q: Can i know about this product's feedback? Q: How long should I wear it? A: Recomend to wear 6-8 hours per day, anytime, except sleeping. Sleep is for relax, should not have any tight garments on you. Q: Why is there piggy picture? What does it mean?